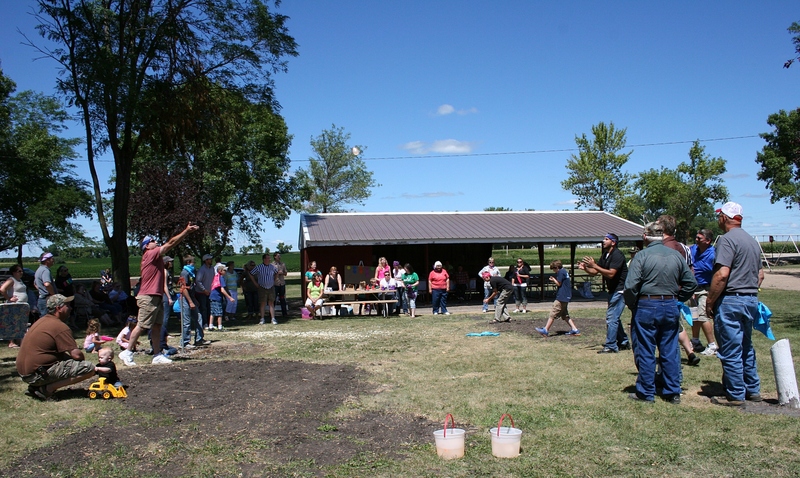 THE THING I APPRECIATE about a little competitive fun at the annual Kletscher family reunion are the memories built and the melding of generations. Review the images below and those published yesterday (click here) and I expect you will agree. I love that my extended family loves to have fun. 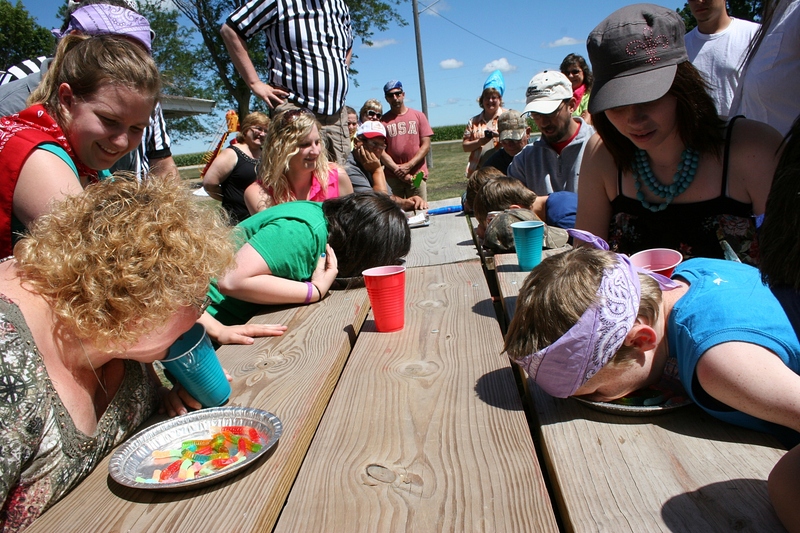 In this game, contestants (my sister Lanae is on the left) race to move gummy worms from a pie plate into a cup, with their mouths. The plates were supposed to be filled with whipped cream, but someone left it in a hot vehicle and, well, there was no whipped cream. Perhaps just as well. 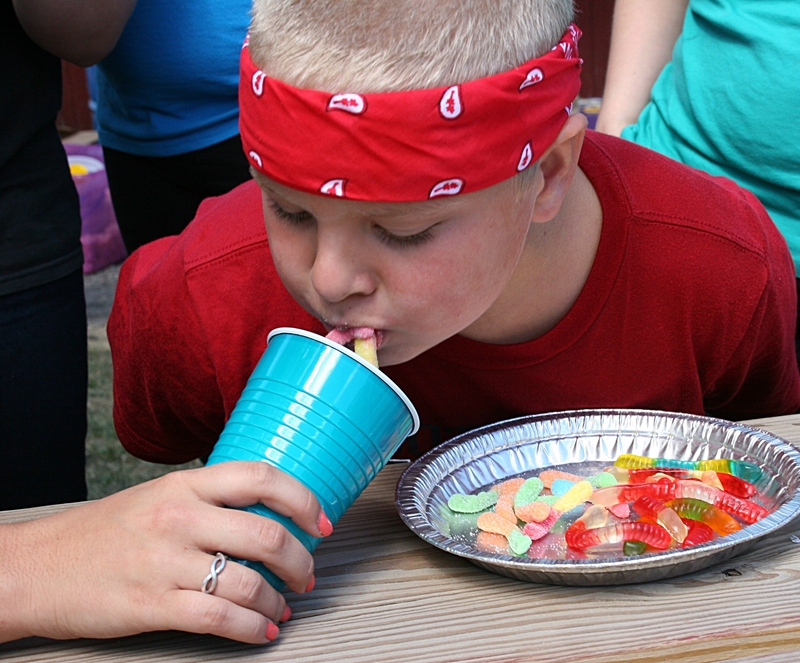 Kegan drops gummy worms into a cup, doing his part for the Rednecks team. 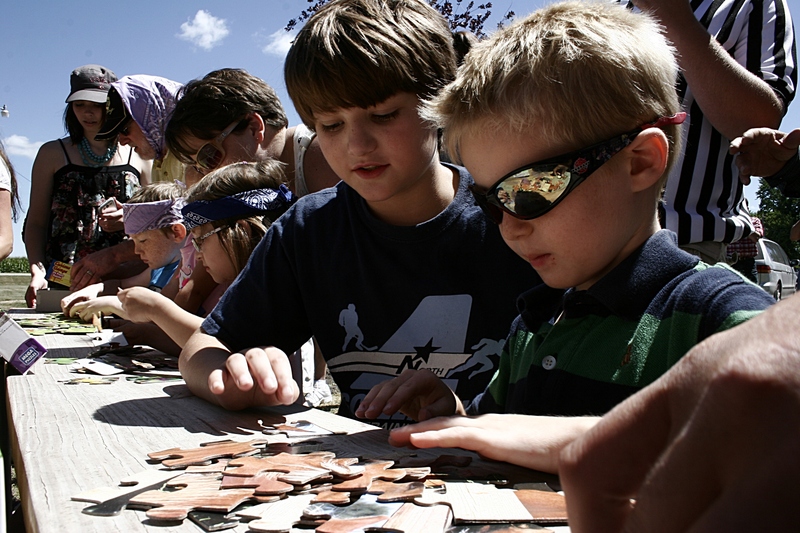 Teams of all ages work together in assembling 25-piece puzzles. 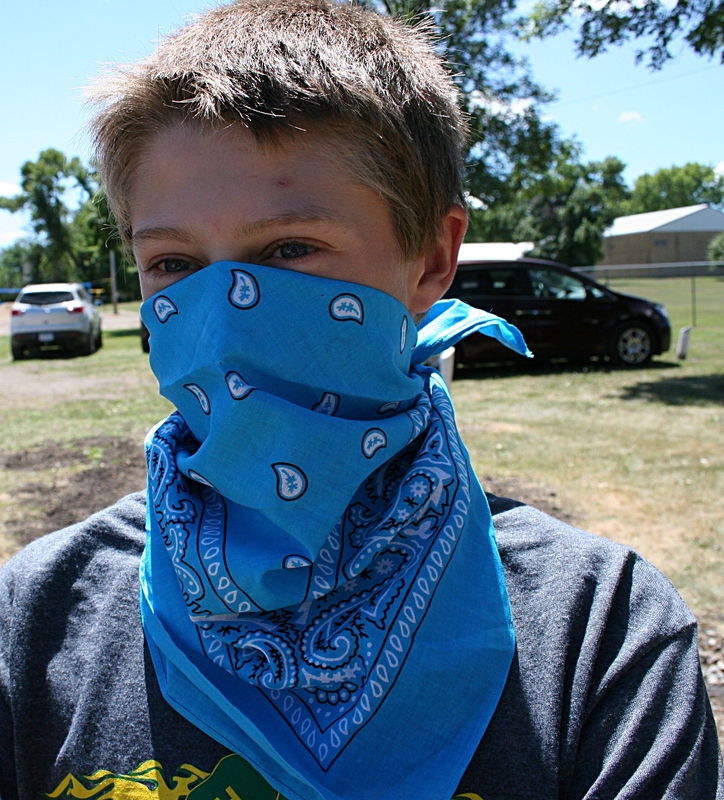 Denver, member of the blue team. Big sister assists little brother in the kids’ nail driving contest. 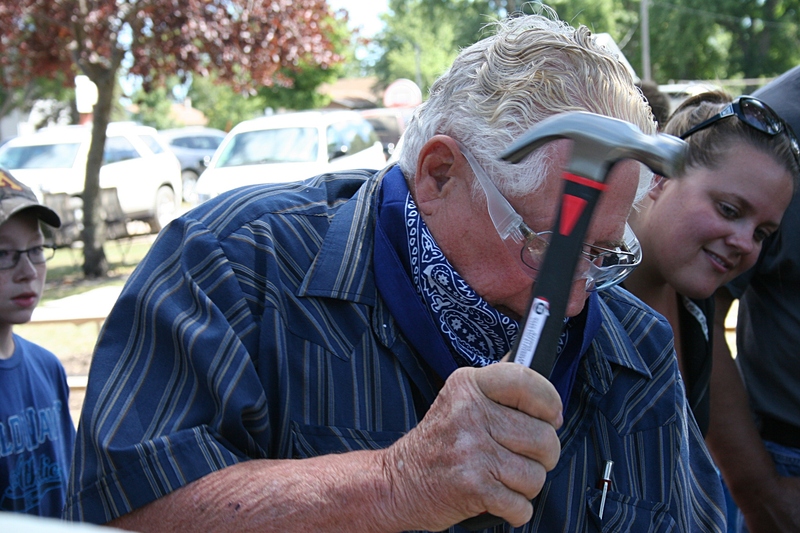 Uncle Wally, an experienced carpenter, won a round of the adult competition in nail driving. 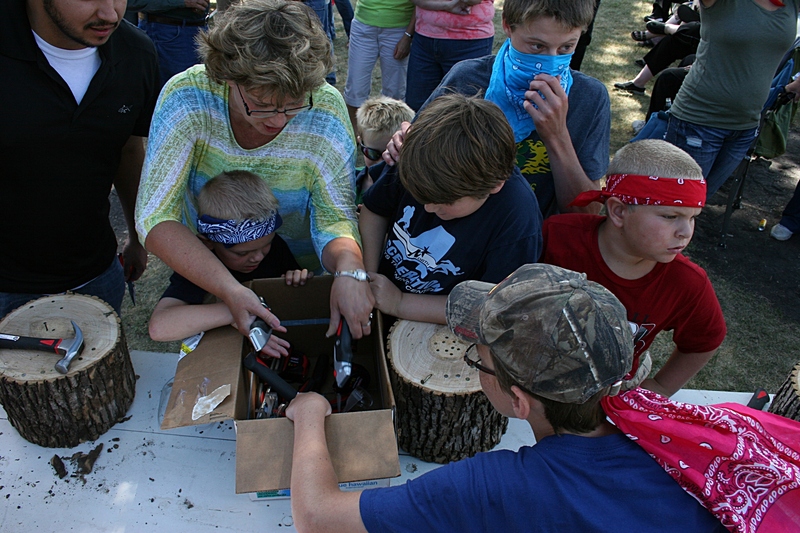 My cousin Sandy, organizer of the games, scrambles to pull boxcutters from the tool prize box before the kids grab the knives. 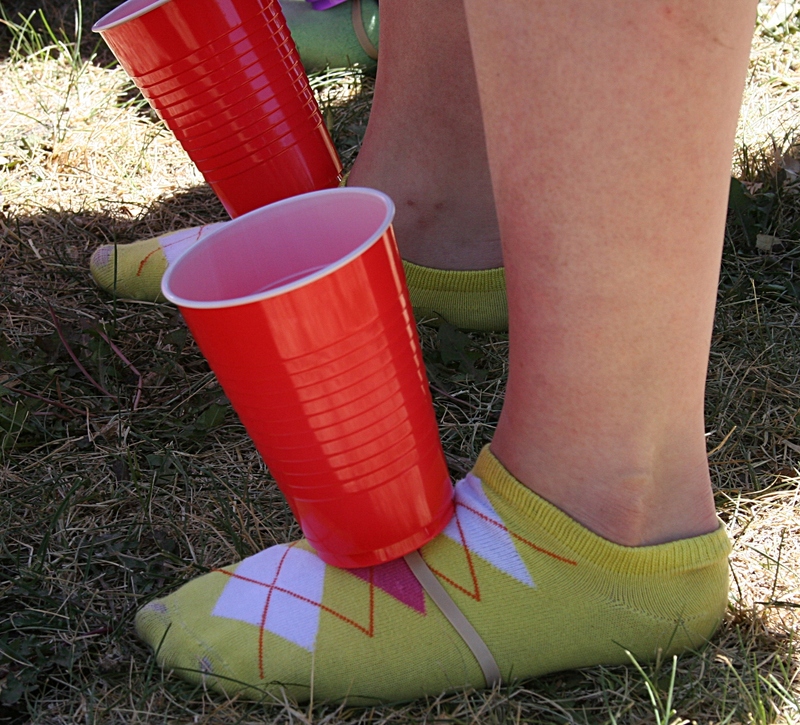 Colorful socks, colorful cups for this contestant in a race to fill the cups with popcorn. 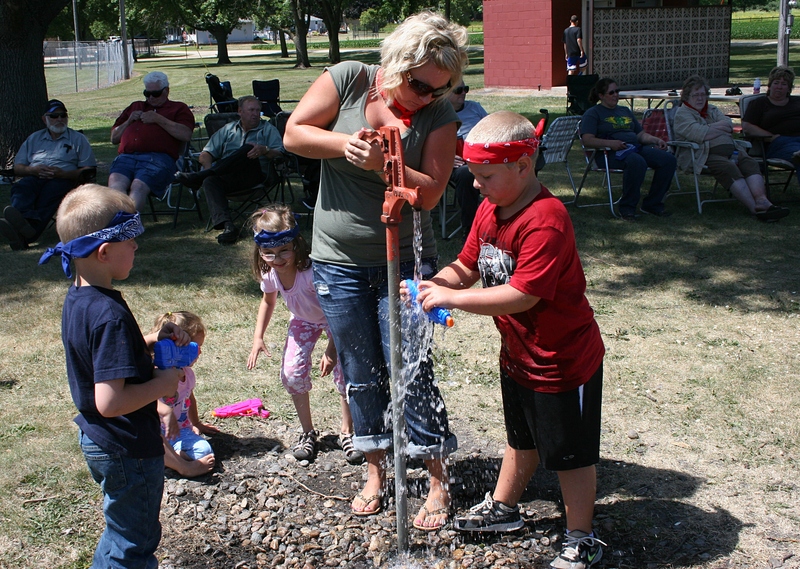 The water spigot proved a popular spot once squirt guns were distributed. That would be my husband, Randy, sporting “safety glasses” for the nail driving contest. 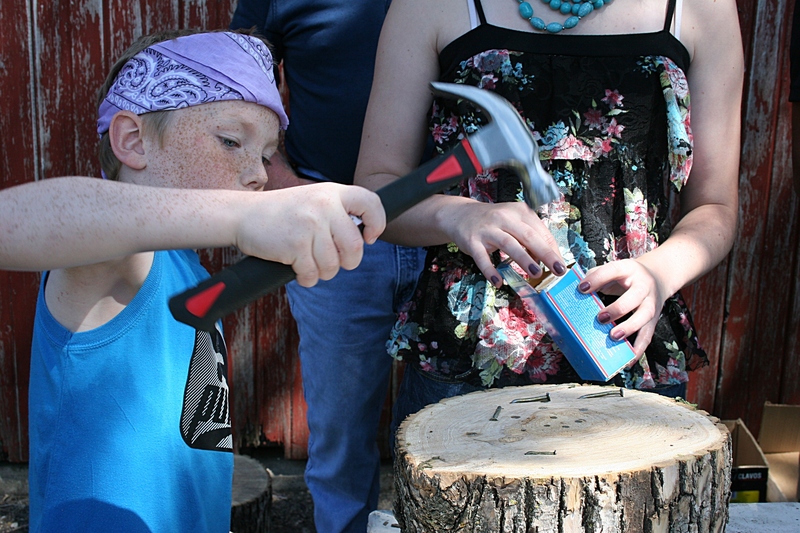 He tied in the first round, pounding 9 1/2 nails into a chunk of wood in one minute. 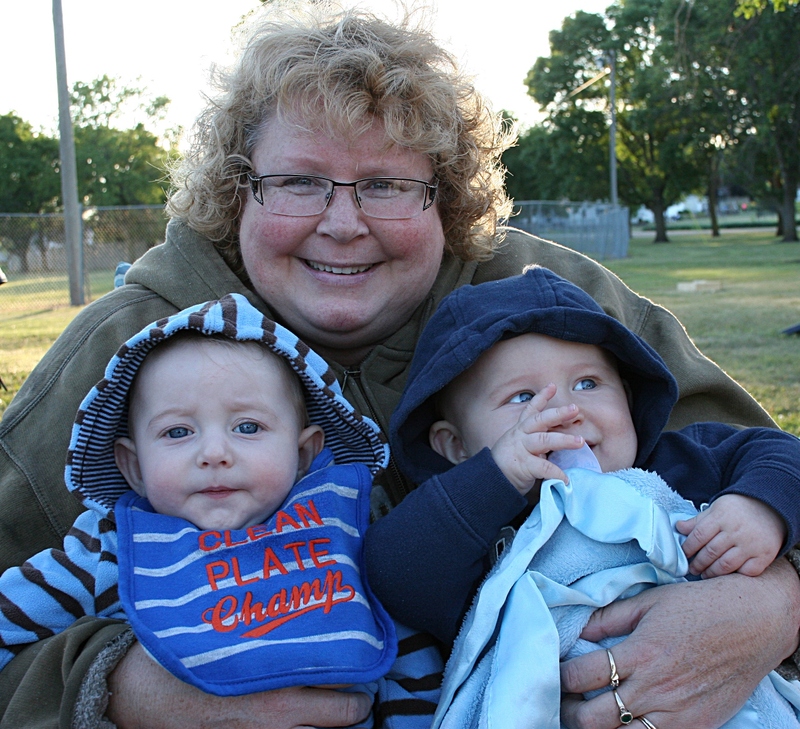 My sister Lanae cuddles 5-month-old cousins Garrett (I think; he’s a twin), left, and Logan, right. They represent the next generation of Kletscher family competitors. 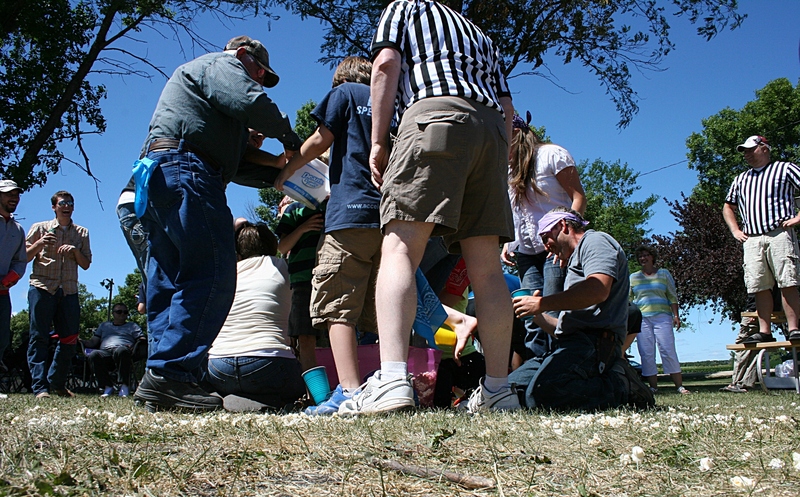 Referees watch over the competition in which contestants fill cups, attached to their feet, with popcorn and race to fill ice cream buckets. THIS YEAR THEY CALLED in the referees to control the competitors. 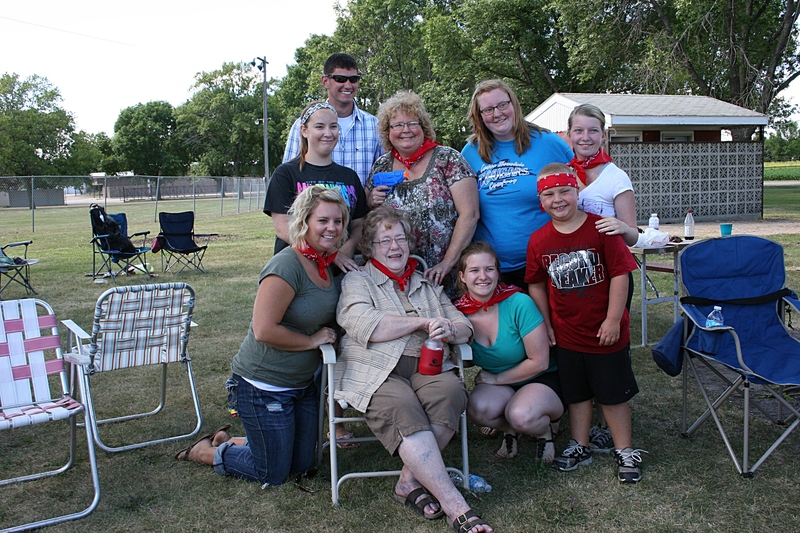 The competitors would be the descendants (and spouses) of Henry and Ida Kletscher, gathered on Sunday afternoon in the Vesta City Park for the annual family reunion. My aunts and uncles and cousins and their kids and their kids’ kids; my mom; four of my siblings and two of their spouses; and a single nephew. 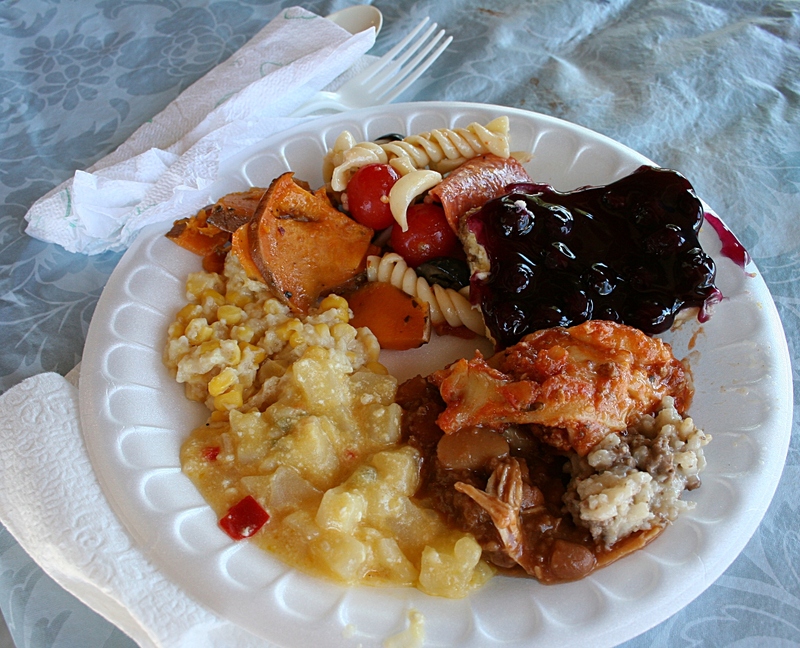 Plating food at the potluck meal spread across several picnic tables in the Vesta City Park shelter. My first plate of food. I made sure to grab a piece of the blueberry dessert, which my Aunt Marilyn brings each year. Wait too long and you miss out on a piece. Fueled by a potluck meal, preschoolers to my 90-year-old Aunt Elaine participated in an afternoon of organized competitive activities ranging from puzzle making to relay races to nail pounding to Kletscher family trivia. 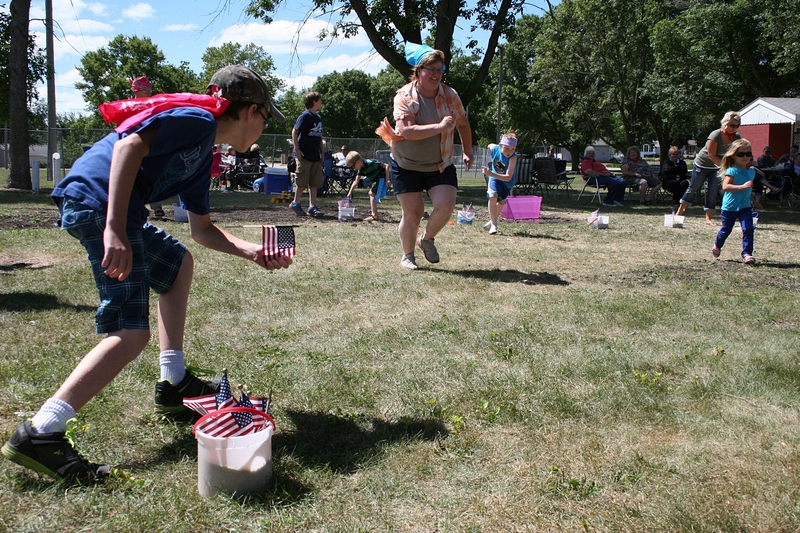 In the flag race, contestants carry flags from one ice cream bucket to another. Laughter erupted. Legs pounded the parched and hardened lawn. Good-natured kidding abounded. Winners in the puzzle making competition celebrate. Contestants assembled 25-piece puzzles. 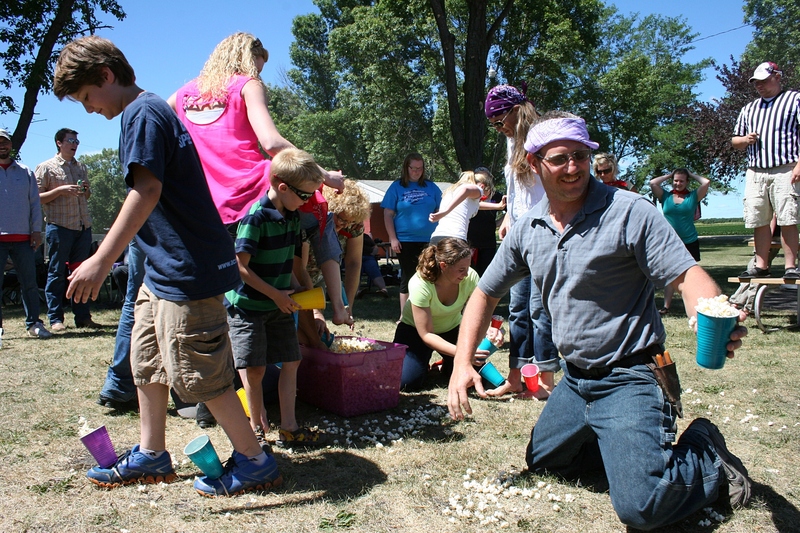 My cousin Greg cheats in the popcorn game in which contestants were supposed to fill cups, attached to their feet, with popcorn. He found his hands to work much better. Cheating ran rampant, despite the two referees, who couldn’t possibly spot every rule infringement. 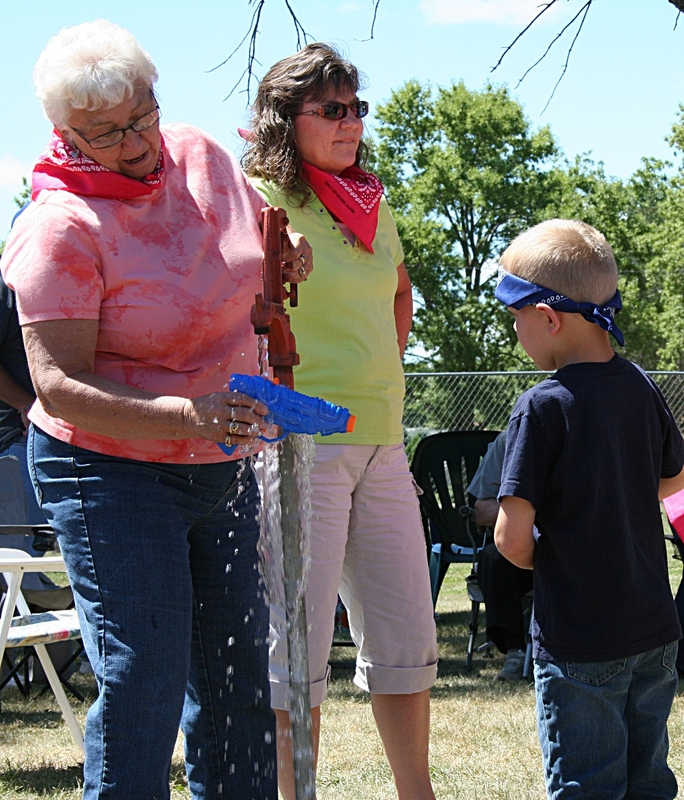 That would be my Aunt Janice filling a squirt gun. In order to protect my camera, I keep my distance from the water balloon toss. I stepped back from the water balloon toss, dodged squirt gun fire, held my camera above the chaos to photograph the competition. 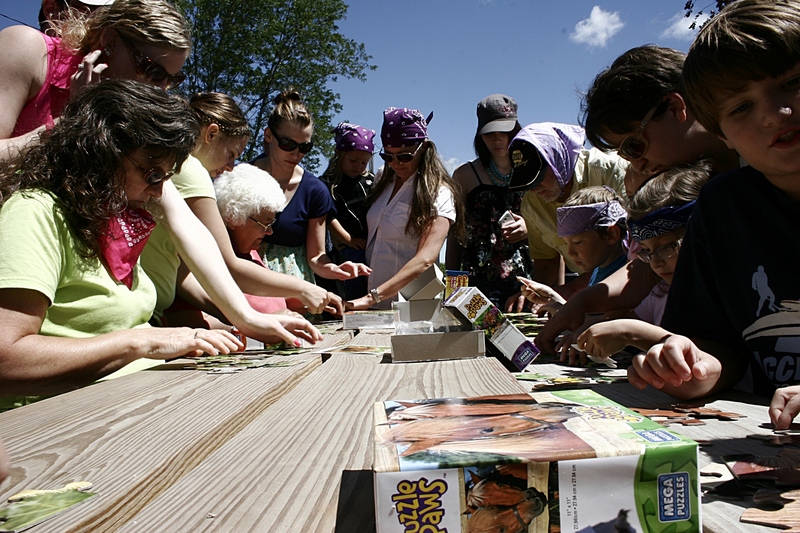 The games begin with assembling 25-piece puzzles. To a distant passerby, the goings-on may have appeared crazy and chaotic and perhaps worthy of a call to the Redwood County Sheriff’s Department. 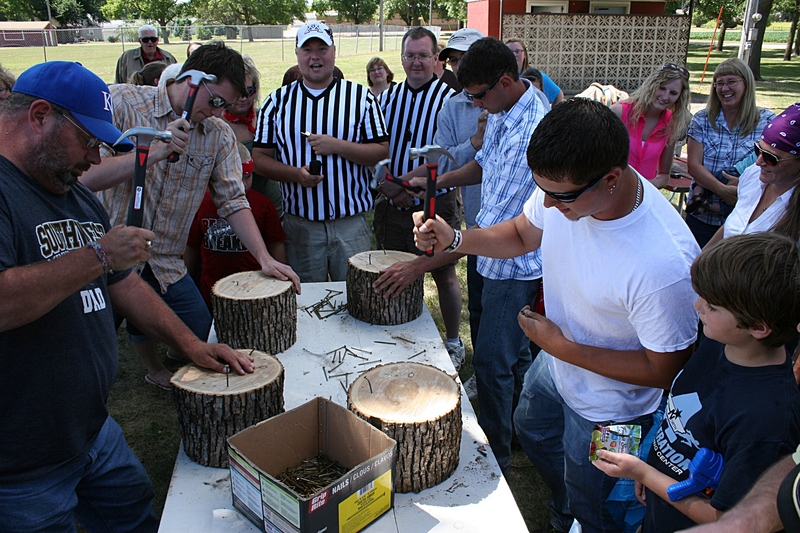 In the nail driving contest, entrants had one minute to pound as many nails as they could into a section of wood. But I observed fun—a family connecting and building memories. Team Red poses for a photo. In many ways, the reunion took me back to decades earlier and evenings of gathering at the farms of extended family members to celebrate birthdays and anniversaries. Then I was the kid, the girl racing across a pitch black farm yard playing “Starlight Moonlight” with my cousins—connecting, building memories. 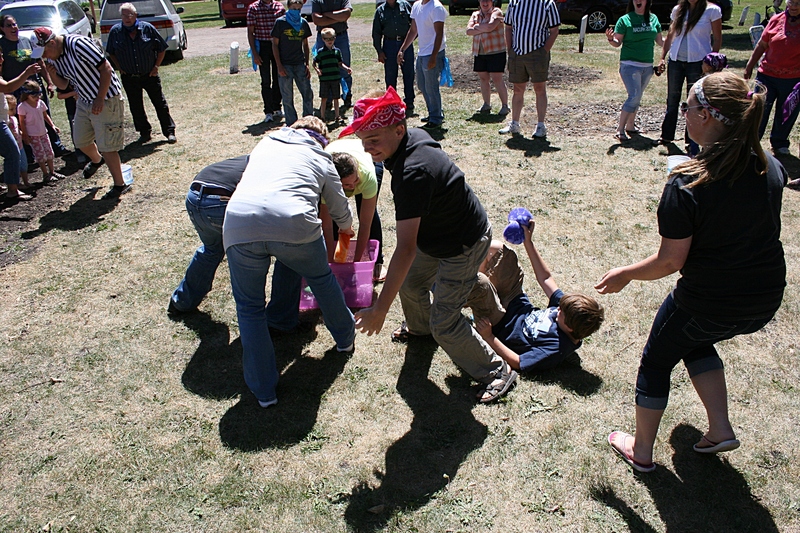 In this game, competitors soak up water with sponges and race to fill ice cream buckets. 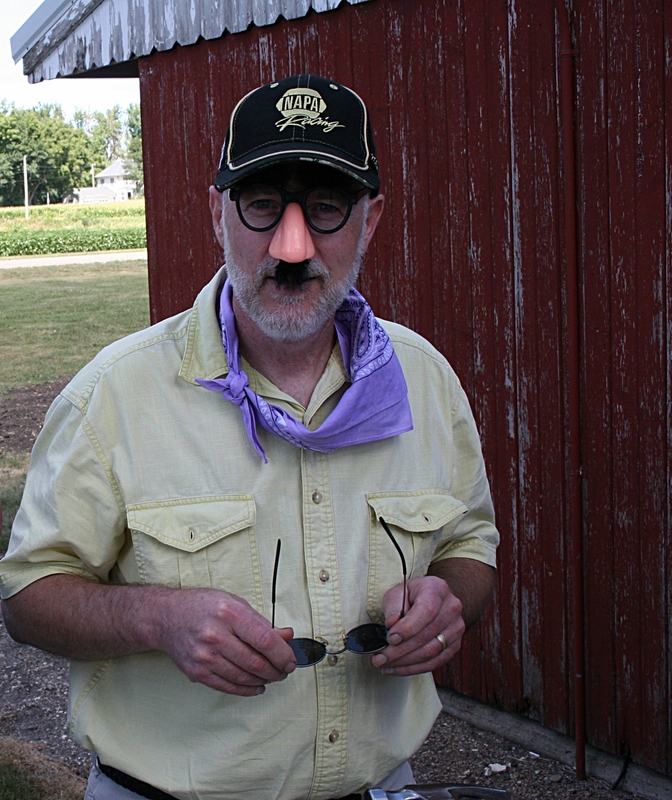 Today I am the photographer, capturing those memories, reveling in the blessings of belonging to a family that cares enough to come together every July in a rural southwestern Minnesota city park a skip over gravel roads from acres of cropland. 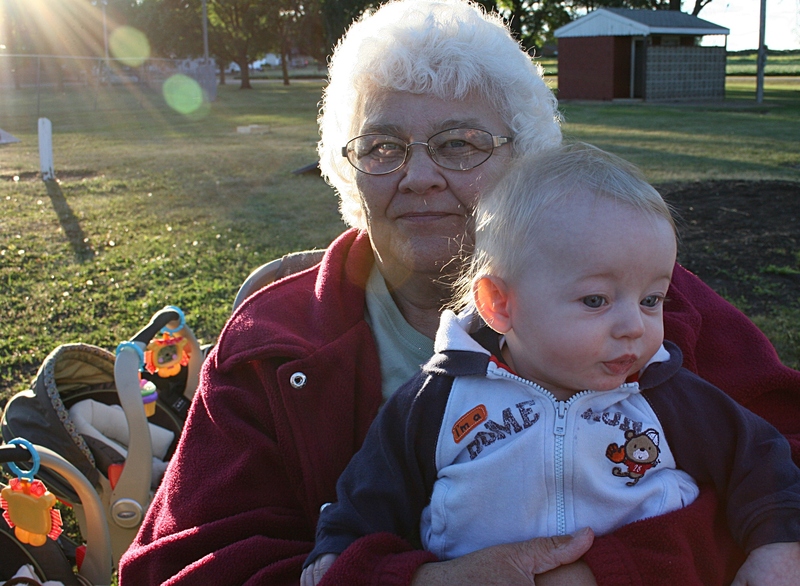 My Aunt Jeanette holds one of her newest great grandsons, who traveled from near Milwaukee with his parents and twin brother to attend the reunion. At five months, Landon (or Garrett, I’m unsure which twin) is among the youngest of Henry and Ida Kletscher’s descendants. This image was shot at the Saturday evening get together. 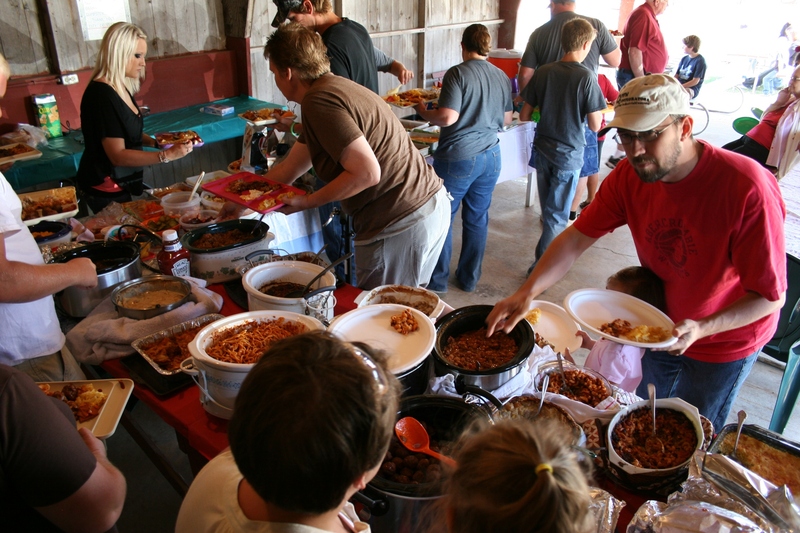 In recent years the reunion expanded to begin on Saturday evening, resuming with the Sunday noon potluck. 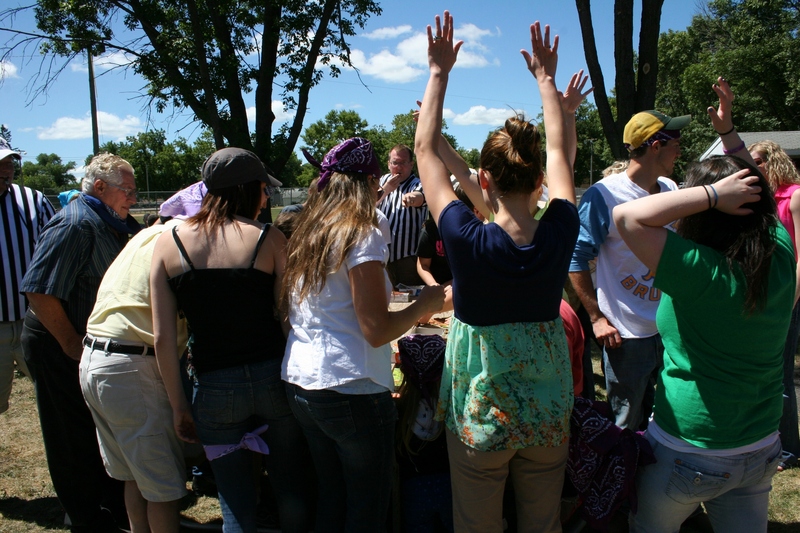 Games were also added within the past five years to keep the young people coming and to mingle the generations. This the land of our forefathers, the home of our hearts, the place where family memories are rooted, here on the prairie. CHECK BACK FOR MORE photos of family reunion fun. …that on a Sunday evening, as the sun slides toward the prairie, I can stand in the middle of the street by my mom’s house and photograph her shadow and that of my husband and myself. 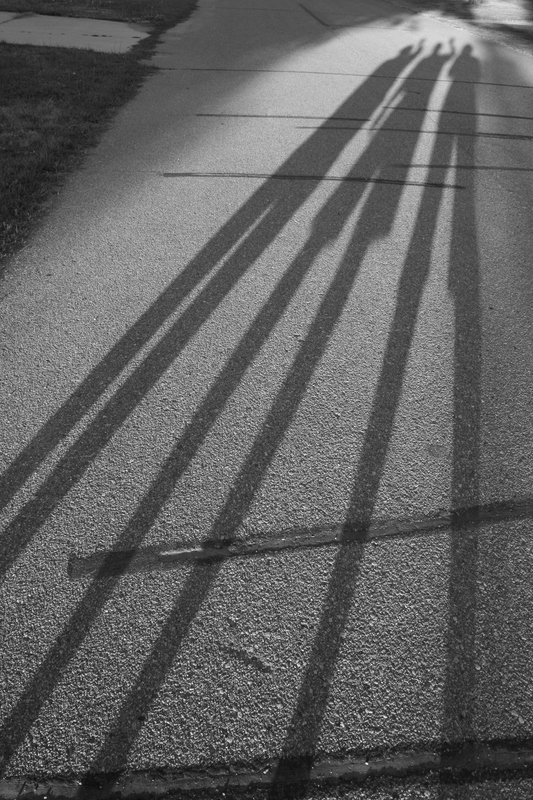 The shadows of my 81-year-old mom, left, my husband in the middle and me on the right, on a residential street in Vesta, Minnesota. We plant our feet on the asphalt and laugh at our 25-foot tall, long-legged selves. As we pose and wave and I struggle to hold my camera still for the laughter, I imprint this moment upon my memory: Prairie light and prairie sky and prairie town. And two people I cherish and love beside me, laughing in the moment at our silly shadows on a splendid summer evening. SMALL TOWNS INTRIGUE ME. Each possesses a unique character. 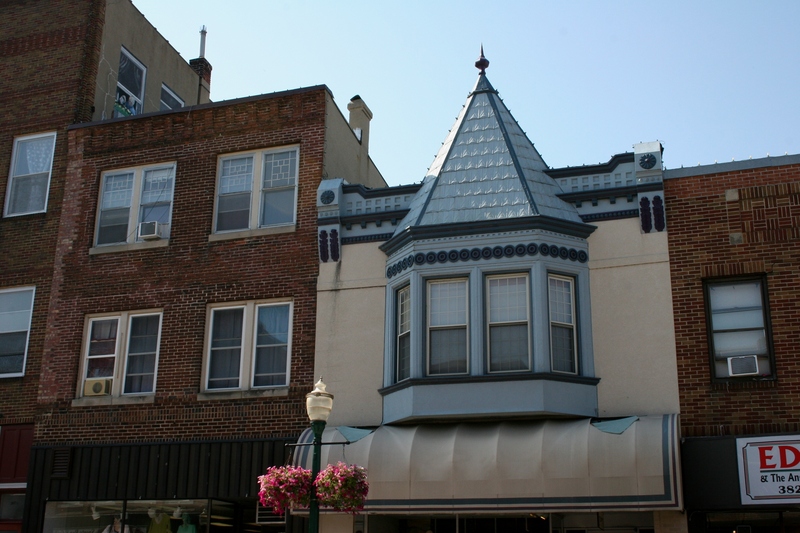 A snapshot of Hayfield’s downtown business district. 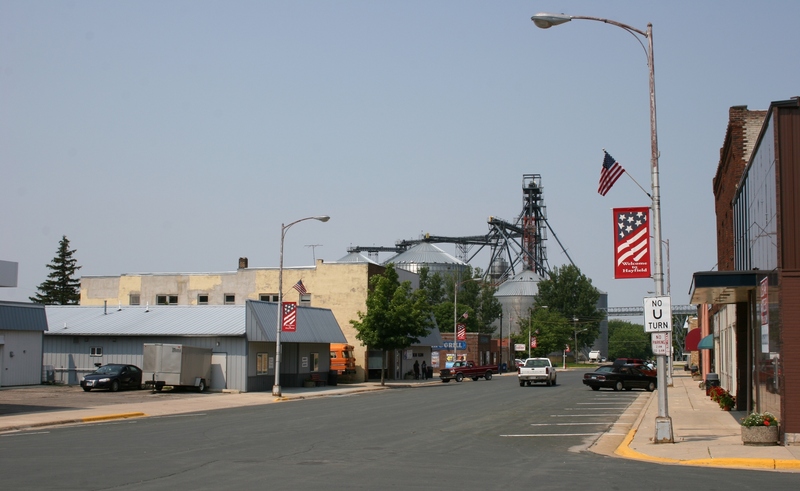 For that reason, and because I favor rural more than urban, my husband and I purposely detour off highways, park our vehicle along Main Streets and explore. 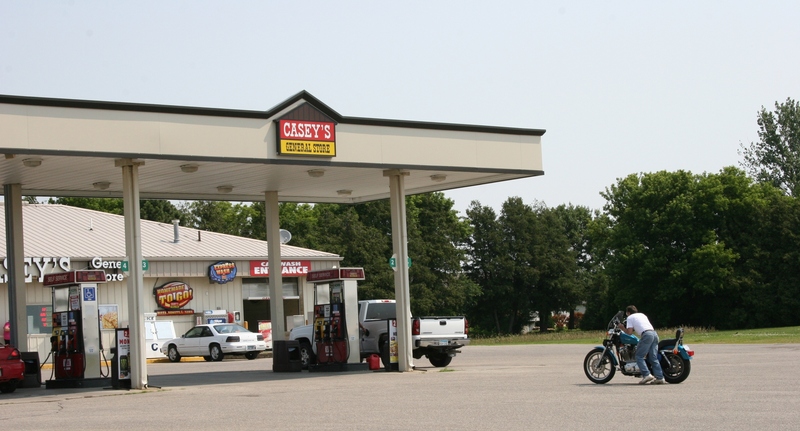 This biker ran out of gas and pushed his motorcycle up to the pumps at Casey’s General Store in Hayfield, just off Minnesota Highway 56. Often we are the only ones walking about, especially since our stops are typically on Sunday afternoons. However, even on a recent Monday morning visit to Hayfield, population 1,300, southwest of Rochester in Dodge County, the downtown was quiet enough that I didn’t have to worry about standing in the middle of the street to take photos. Welcome to Hayfield. 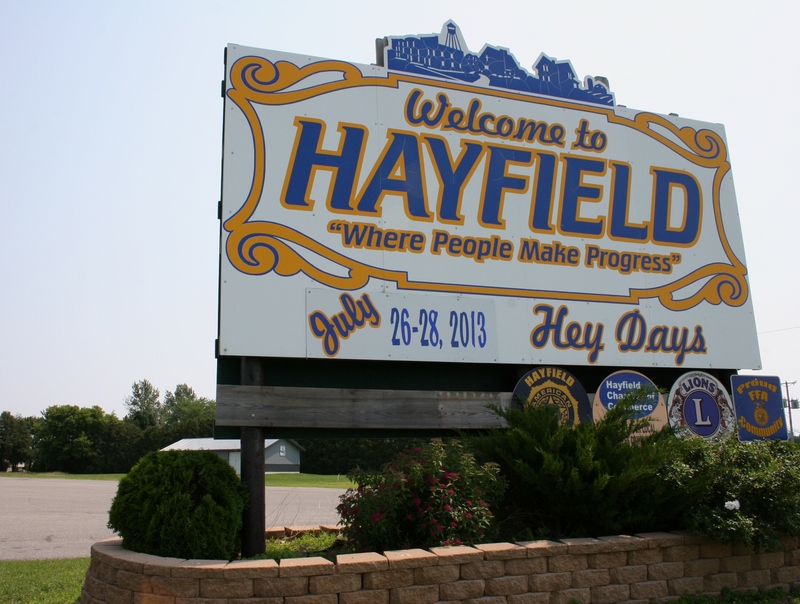 So…I’m wondering whether the town is named after a person or a hay field. 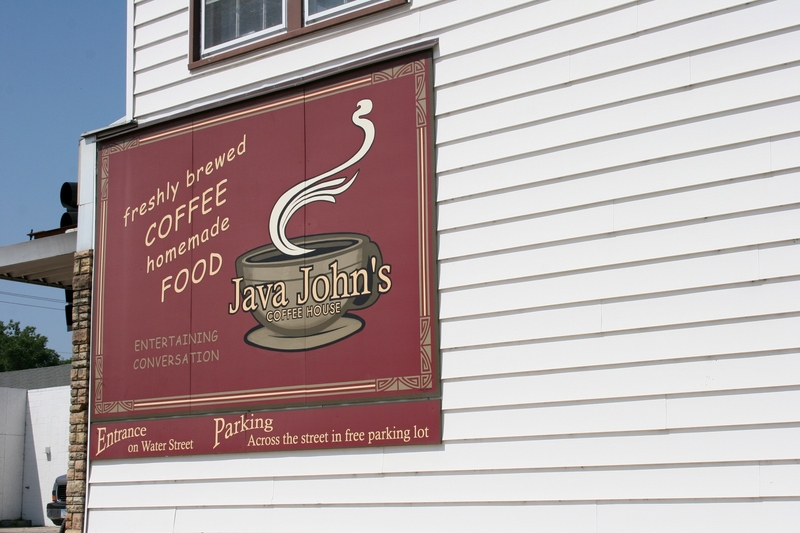 Our community has had many projects which have been accomplished by grants, donations and countless volunteer hours. 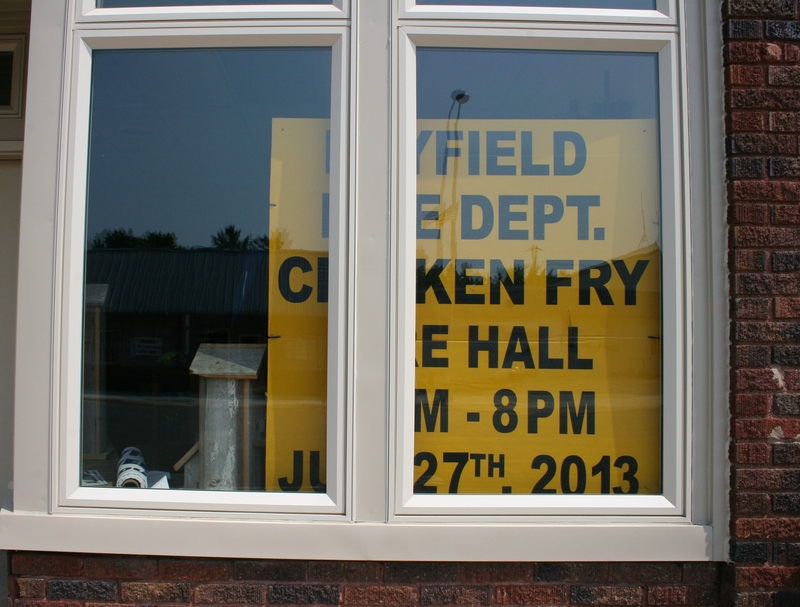 A sign in a window advertises the chicken dinner served during Hey Days. 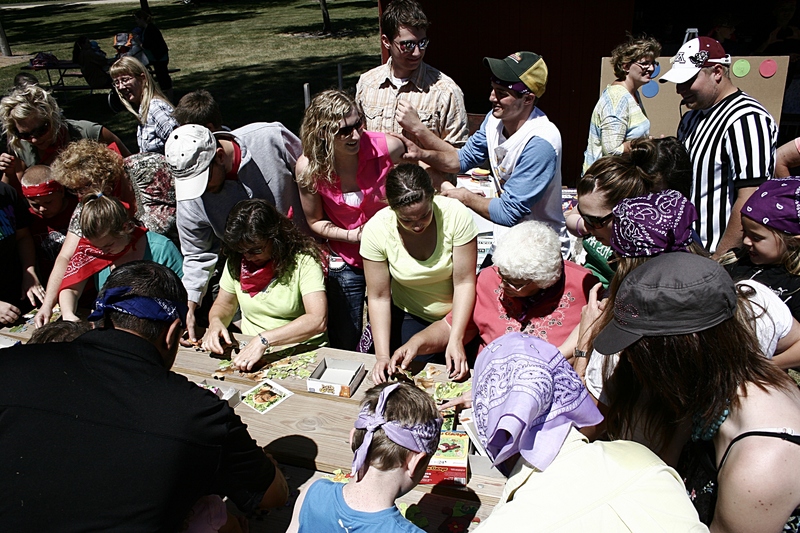 The annual community celebration of Hey Days, slated for July 26 – 28, also involves countless hours of volunteerism. That’s the thing about small towns. People don’t necessarily sit and wait for someone else to do something. They just do it. 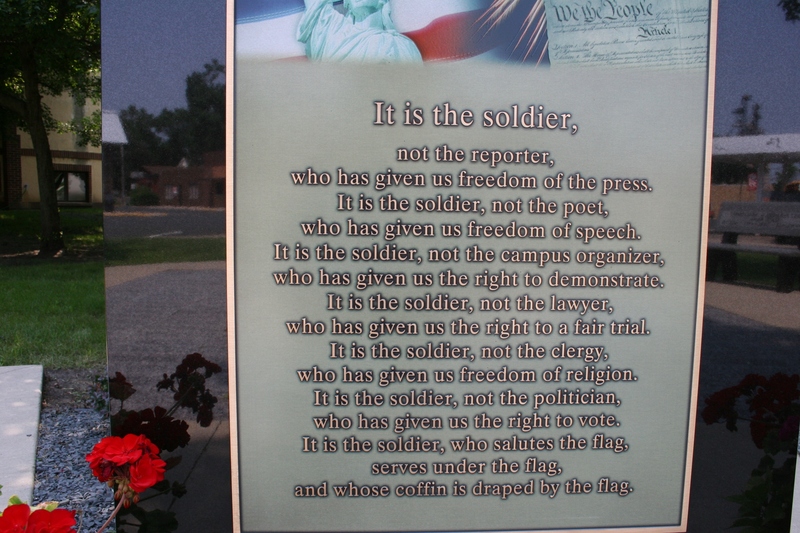 Part of the impressive vets’ memorial. I bet volunteers planned, raised funds for and helped build the veterans’ memorial park next to First Presbyterian Church at the end of the business district. It’s one of the most impressive memorials we’ve seen. 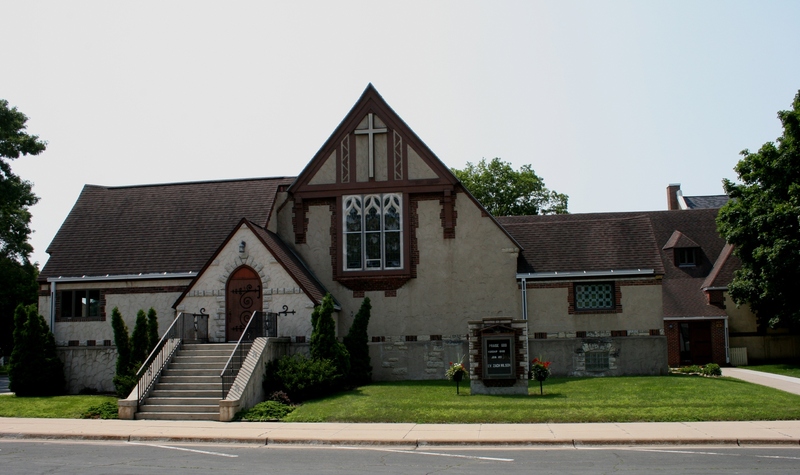 First Presbyterian Church, next to the veterans’ memorial. 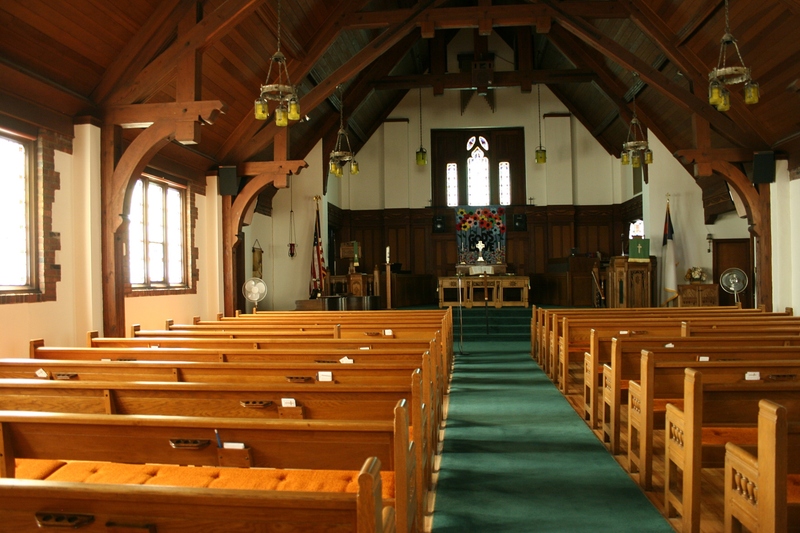 Inside that lovely old church. That memorial is definitely worth a trip into town as is the church. We found the door unlocked and so let ourselves into this beautiful sanctuary. I’m pretty certain the guy working on a school bus at the bus garage was watching us. Font art at the former newspaper office. And more art on the former news office. 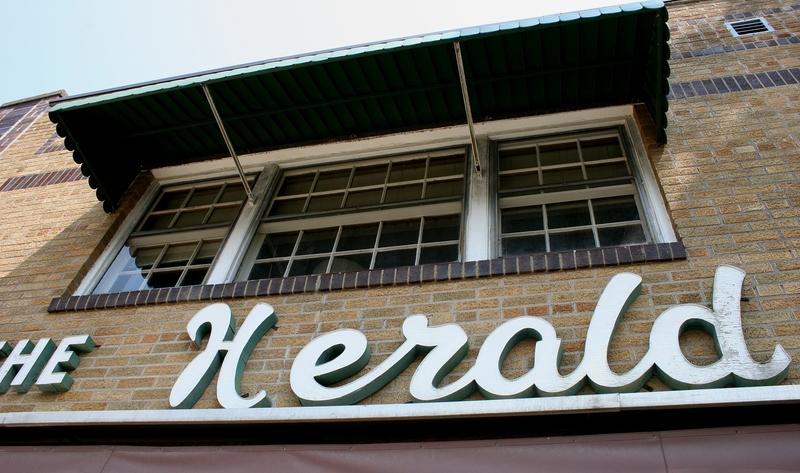 Across the street, the font and paintings on the former Herald newspaper office, now a home, caught my eye. 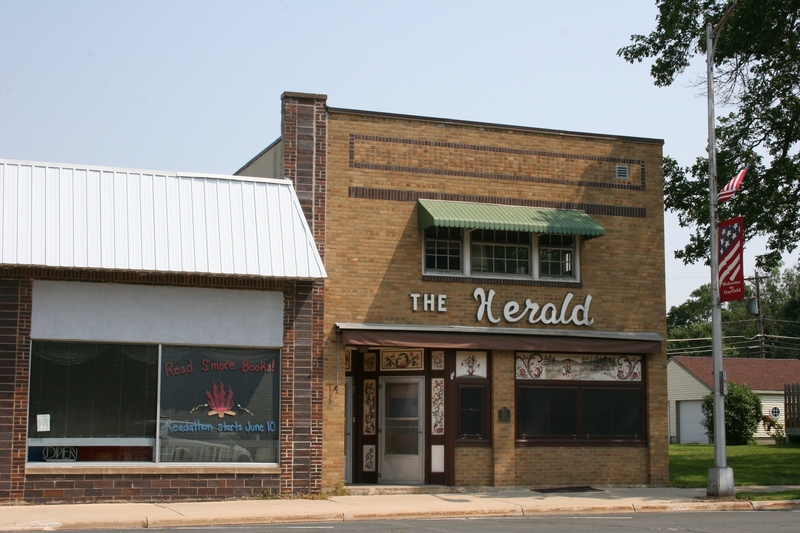 The newspaper is now merged as the Star Herald based in nearby Dodge Center. The library on the left, the former newspaper office on the right. Next door I tried the door of the library, only to find it locked. 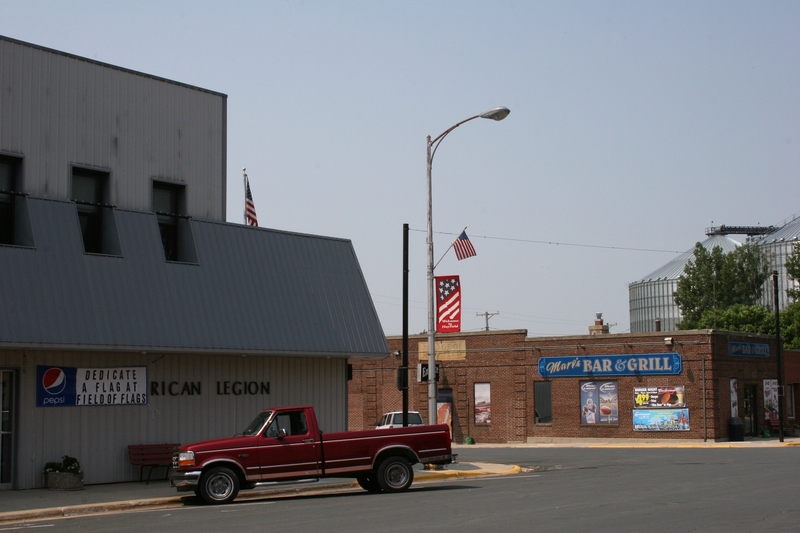 Like most small towns, you will find a Legion and a bar and grill in Hayfield. Yes, when I explore small towns, I’ll always try the doors. Always. 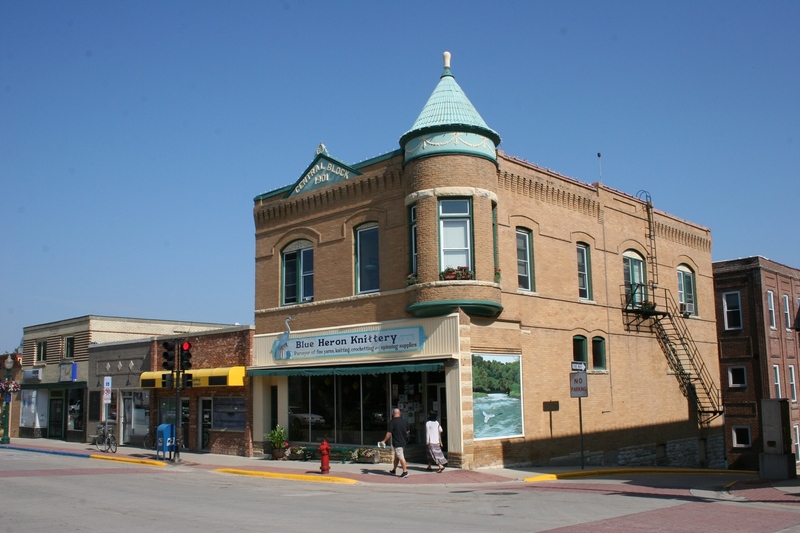 The Blue Heron Knittery is housed in this historic building. 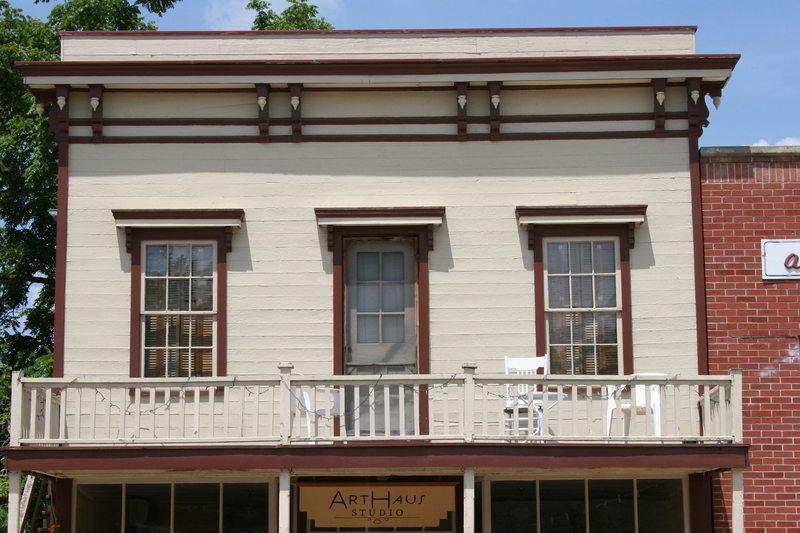 FOR SOMEONE LIKE ME who delights in historic buildings, the northeastern Iowa river town of Decorah offers an ideal destination for viewing an abundance of aged architecture. 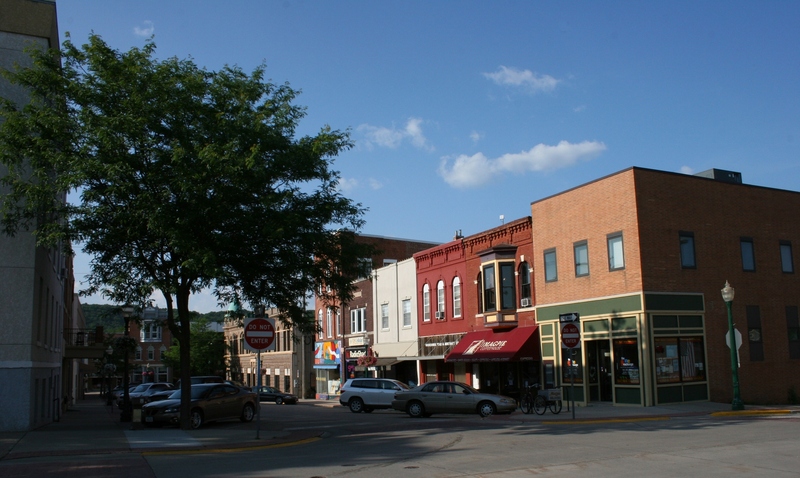 If you’re of Norwegian ancestry, which I’m not, you’ll especially enjoy Decorah. Be ware the trolls and gnomes. 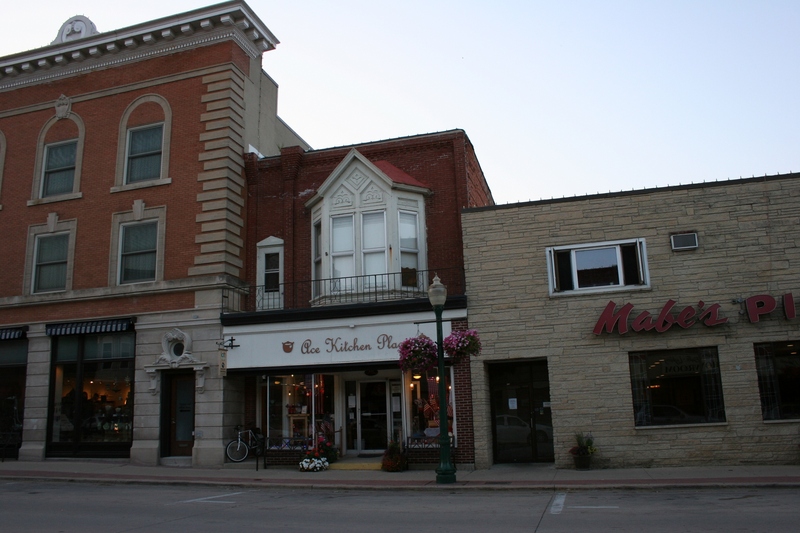 But downtown Decorah is about so much more. 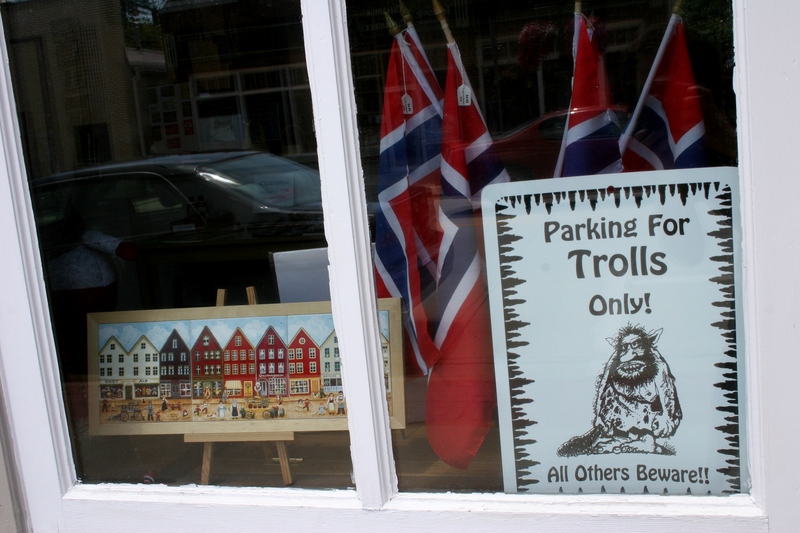 It’s about Norwegians and shopping and a river town with a distinct personality. 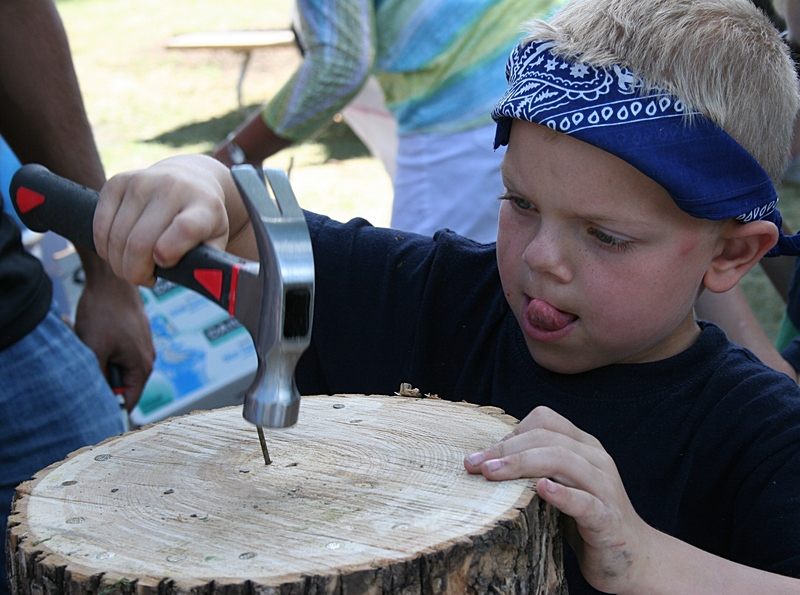 This weekend, July 25 – 27, Decorah celebrates its annual Nordic Fest. Click here to learn more. 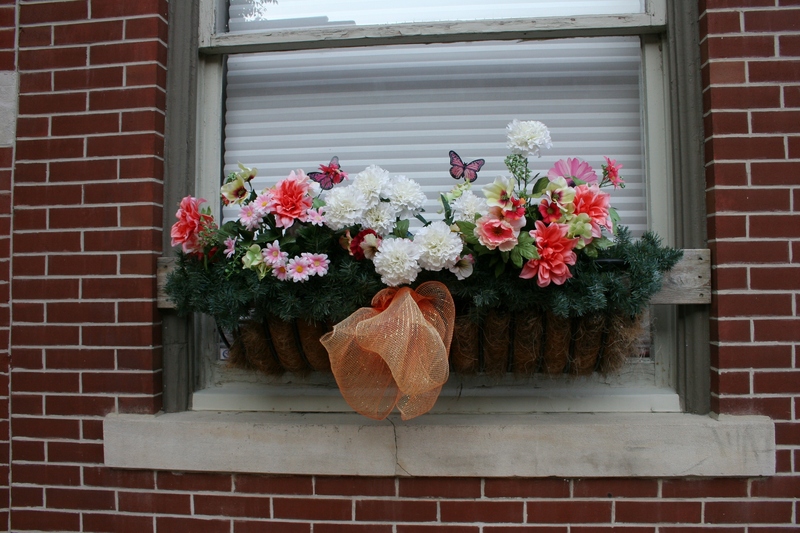 Numerous buildings feature sweet little balconies. A side street off the main route through downtown. So much variation in building design and height. 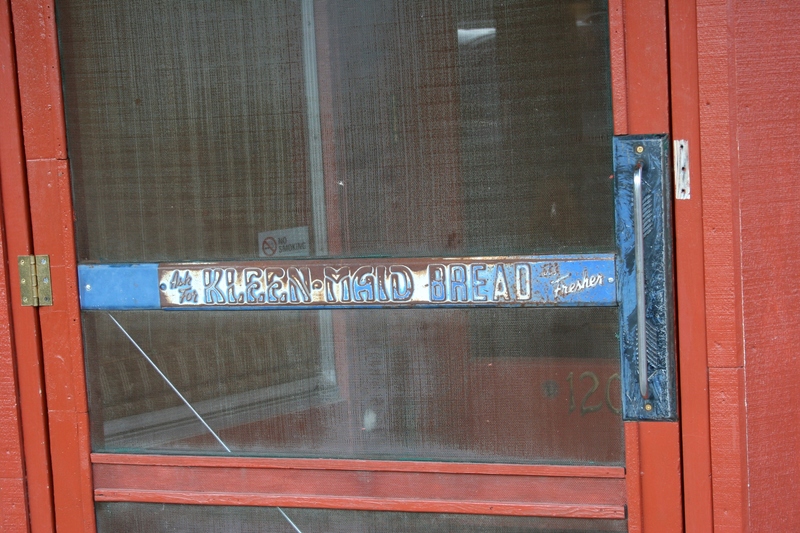 Love this original signage on the old screen door that bangs behind you at La Rana, a charming restaurant. 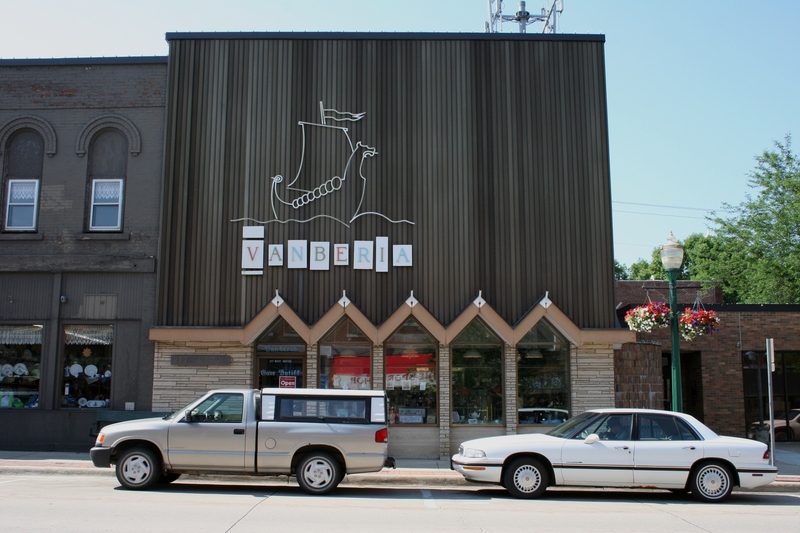 Vanberia, where you can shop for all things Norwegian. 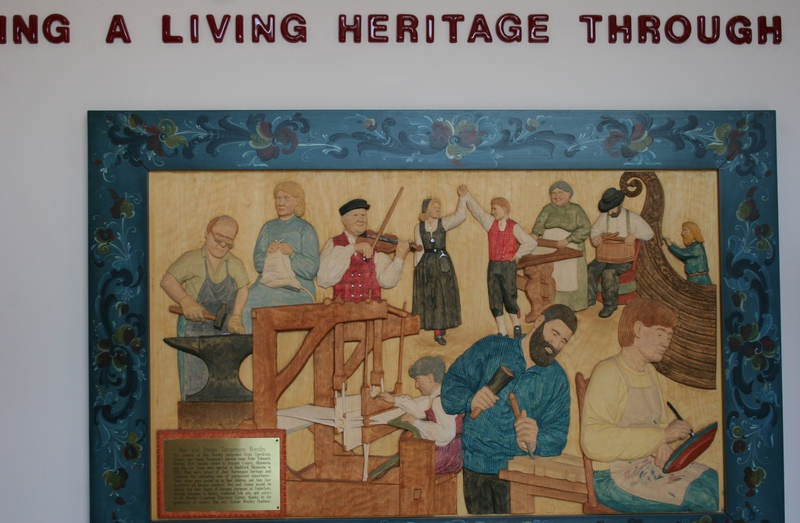 This art, in the entry of the Westby-Torgerson Education Center, celebrates the Norwegian heritage. 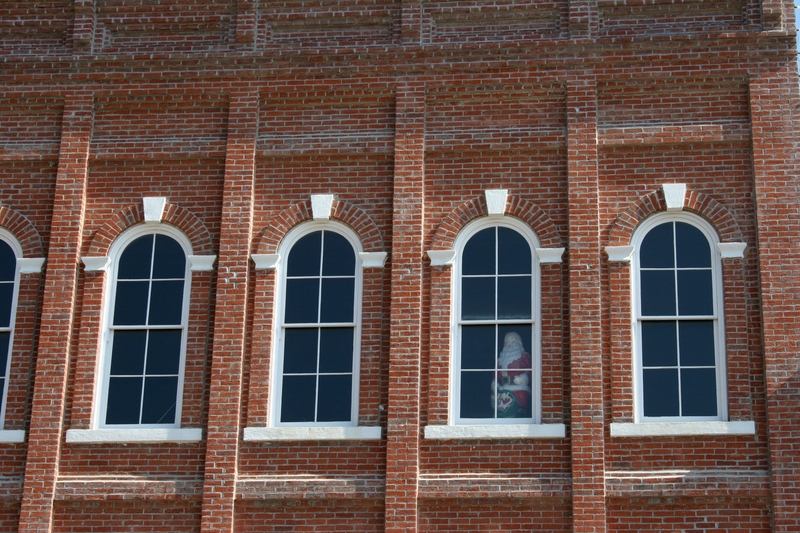 I noticed Santa in this second story window. 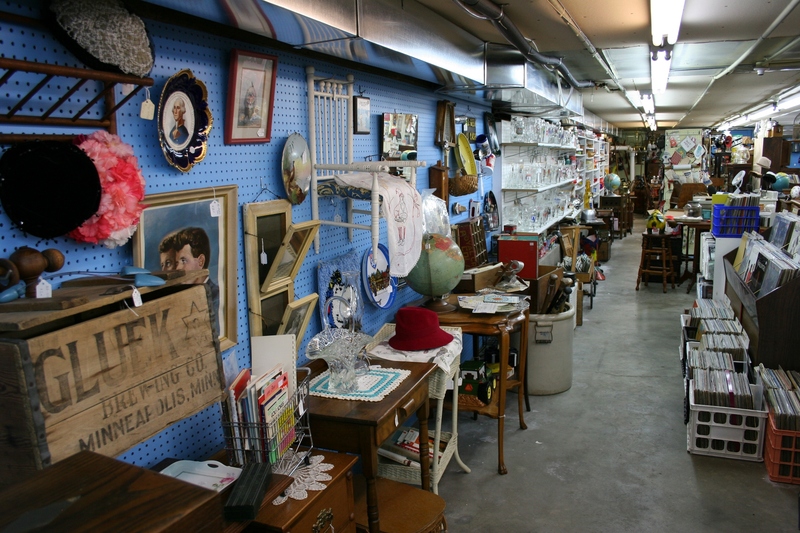 Shopping for antiques and collectibles in the basement of Eckheart Gallery. 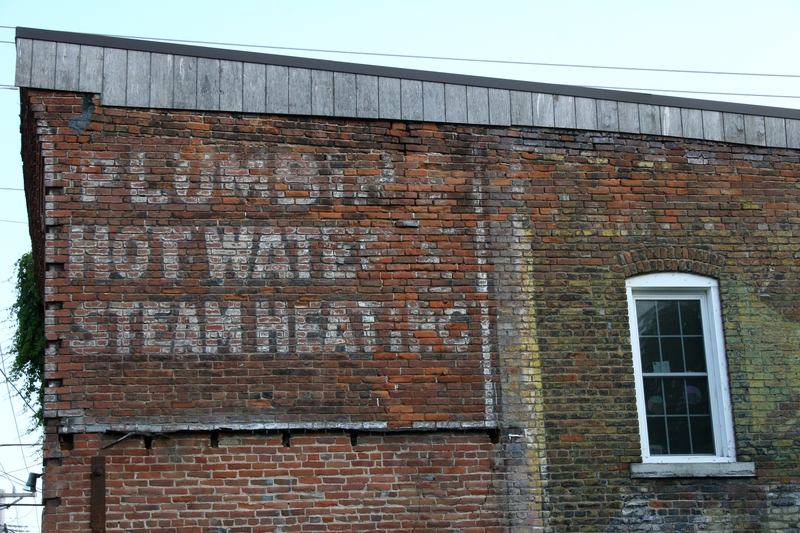 Look close for remnants of the past. FYI: Click here to view a previous downtown post. Click here to view a post on Storypeople. And click here to see a local favorite ice cream spot, The Whippy Dip, which is near downtown. Watch for more posts from Decorah. Be careful what you say when you walk past my Faribault home, where my office is located within feet of the sidewalk and my window is thrust wide open. The above quote came directly from the mouth of a young woman moments ago as she chatted with a young man. GOOD MORNING. It’s 6 a.m. And, if you’re an avid garage saler and have the morning free, you likely already are preparing your route of must-hit sales. 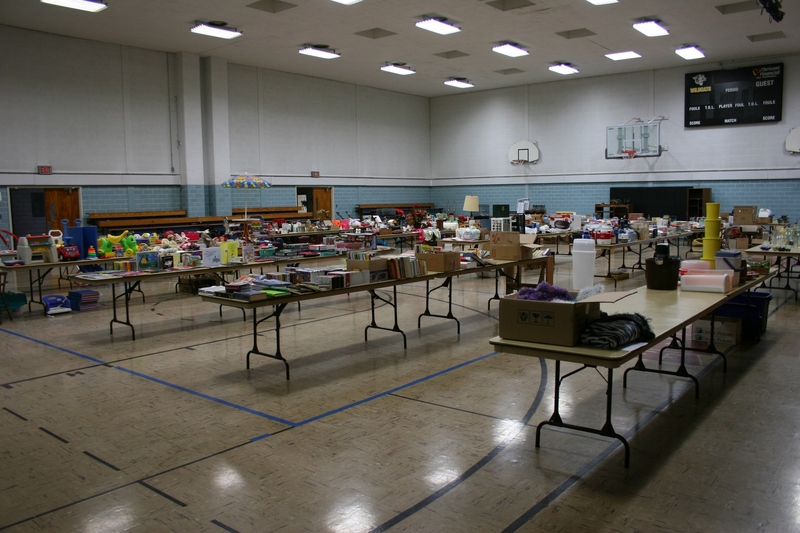 An overview shot taken Tuesday evening in the Trinity gym with more items to be set out on Wednesday. 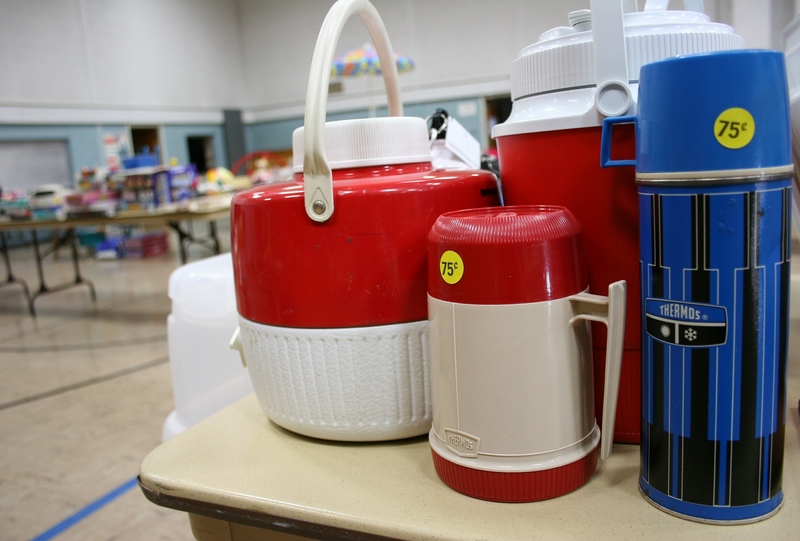 In Faribault, add the Cannon Valley Lutheran High School sale to your list. 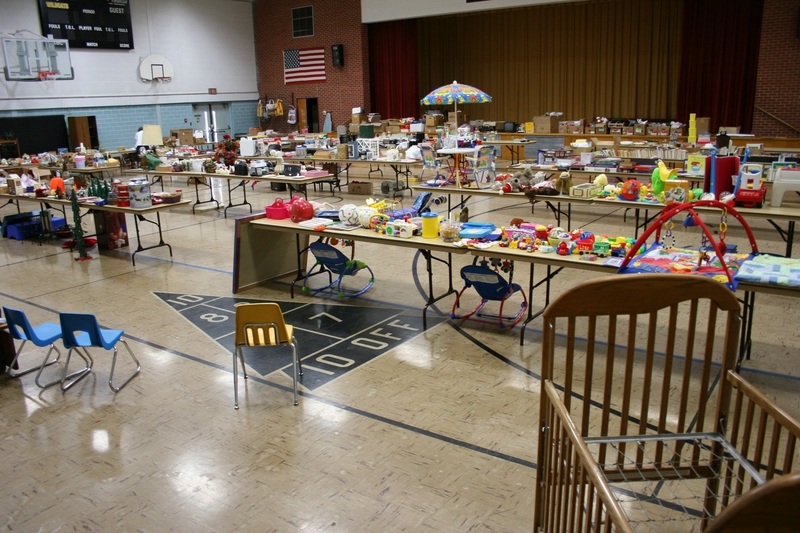 Doors to the sale site, the gym at Trinity Lutheran Church, 530 Fourth Street Northwest (Minnesota Highway 60 across from McDonalds) open at 8 a.m. and close at 6 p.m. Thursday, July 25, and Friday, July 26. Saturday, July 27, hours are 8 a.m. – 11 a.m.
Frames and mirrors and merchandise reflected. 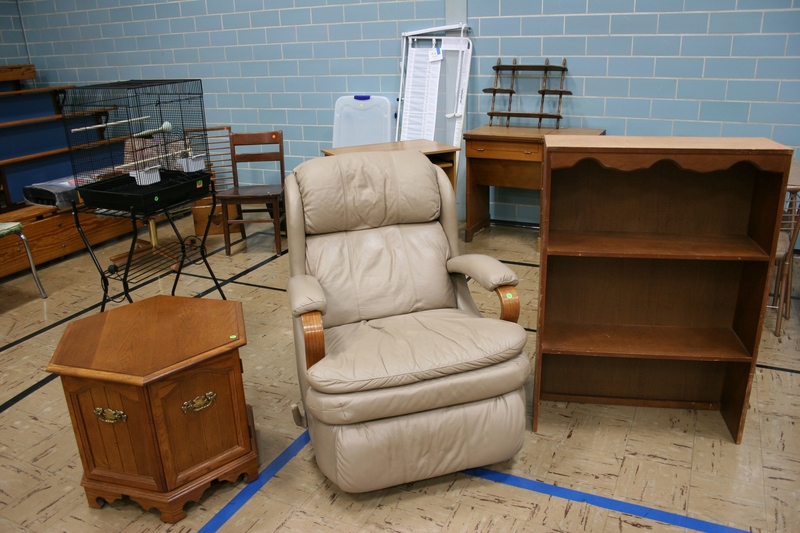 Except for clothing, of which there is none at this sale, you will find the usual assortment of merchandise ranging from household décor to kitchenware, books, furniture, toys, sporting equipment, some collectibles and more. A bit overwhelmed by the volume of offerings, I methodically worked my way through the gym, photographing items I found of particular interest. Note that I am drawn to vintage more than anything. 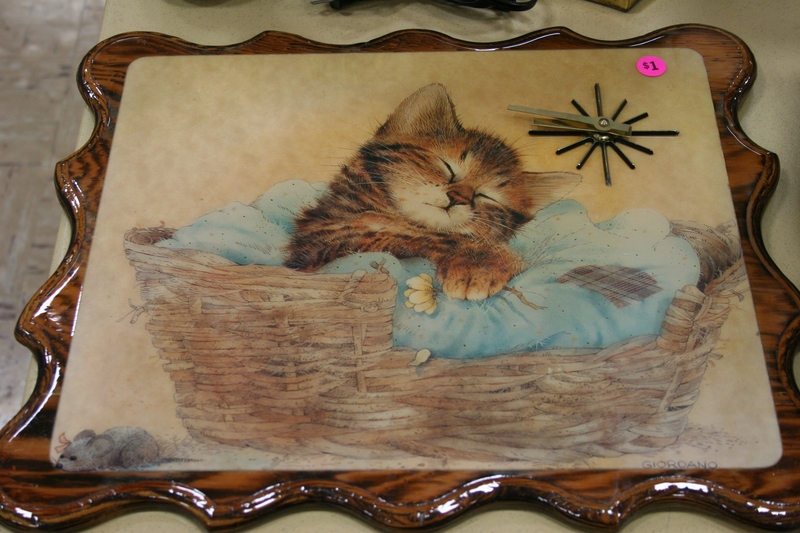 A kitschy vintage clock for the cat lover. I collect vintage drinking glasses and tablecloths, but did not uncover any during my one-hour walk-through. That’s just as well. I already have more than I need. 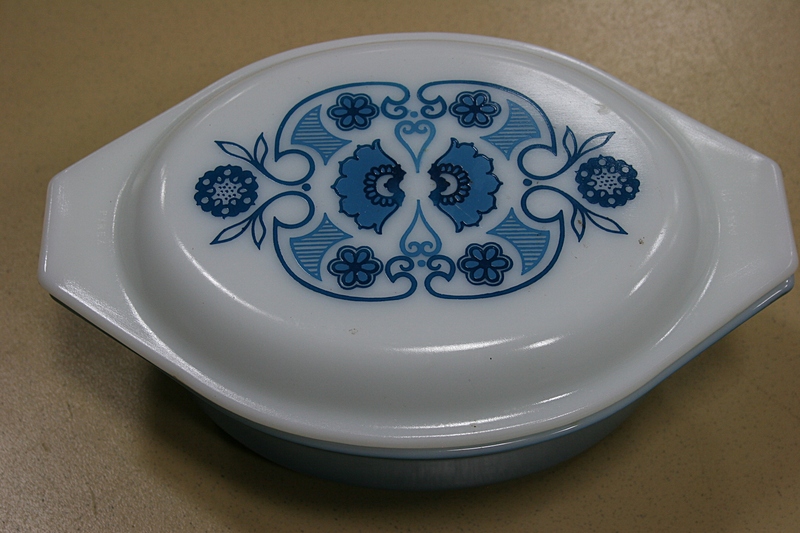 A beautiful Pyrex casserole for the collector. A large bowl for the Pyrex collector. 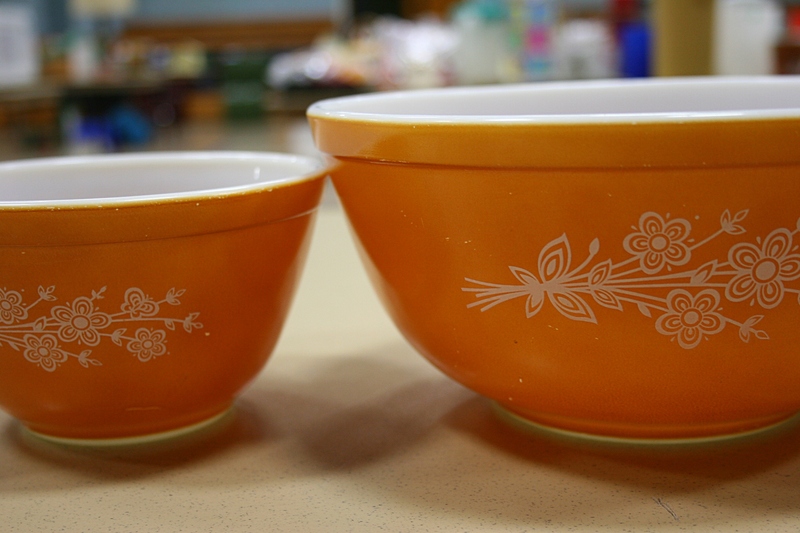 And two more beautiful Pyrex bowls. 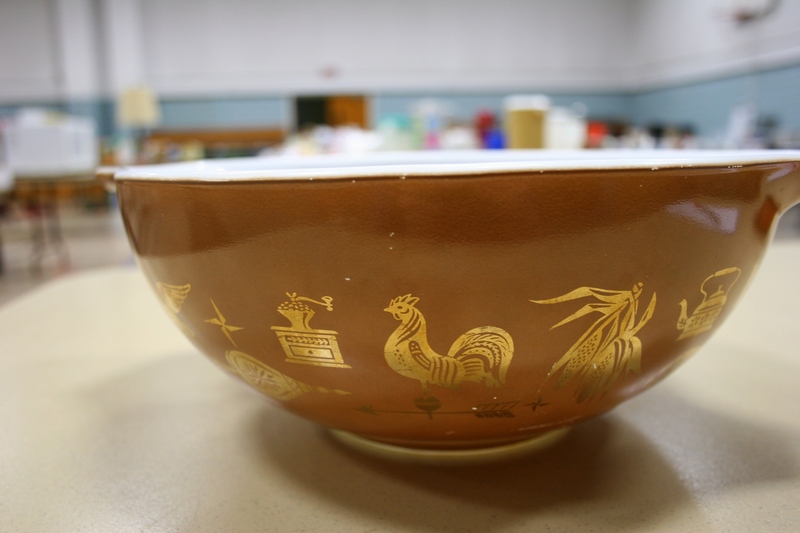 I suggested to one of the organizers that the three Pyrex bowls and casserole I spotted ought to be marked at collector prices. “There will be collectors here,” I advised her. 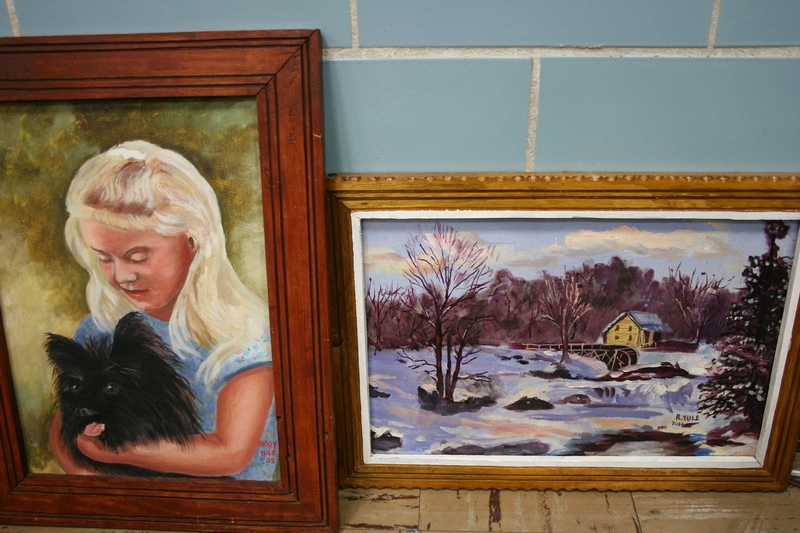 “Puppy Love” and “Winter Solitude” by Rhody Yule, appraised and priced at $395 and $375. 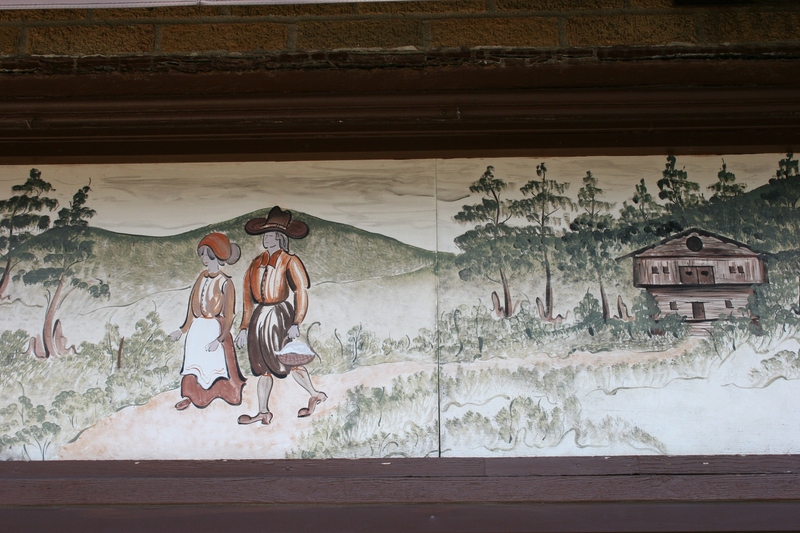 If you’re an art collector, you will want to examine four paintings by my friend, Rhody Yule, a Faribault sign painter and prolific artist whose work was featured in a 2011 gallery exhibit at the Paradise Center for the Arts six months before his death at age 92. He was a remarkable man of deep faith and I was blessed to be gifted with one of his religious themed paintings. Now you, too, can own a piece of Rhody’s art. 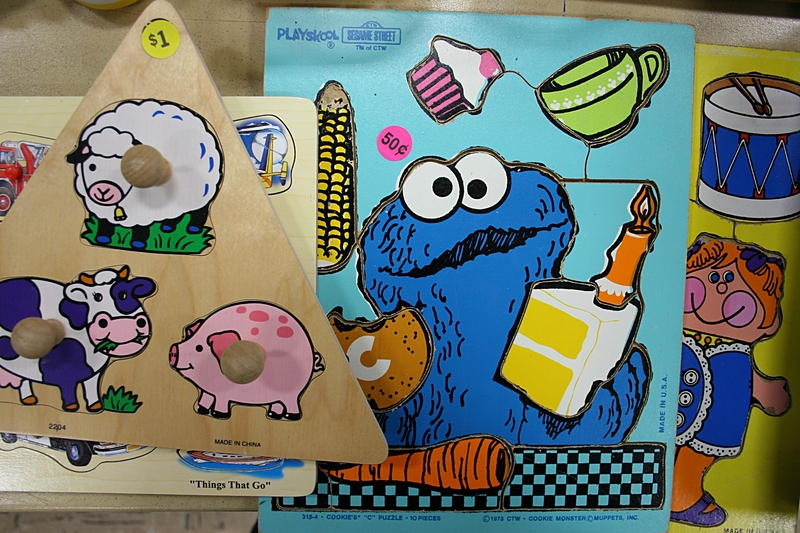 Some wonderful wooden puzzles, newer and older. If I had young kids or grandkids, I would have scooped up lots of books and toys, most in excellent condition. I did nab a homespun poetry book, The Old Hometown, by Faribault resident Marlene Hyatt Meehl, now deceased. I also found two blackboards to use at my daughter’s wedding reception. Another view of that gym full of merchandise, to which more has been added since I took this photo. 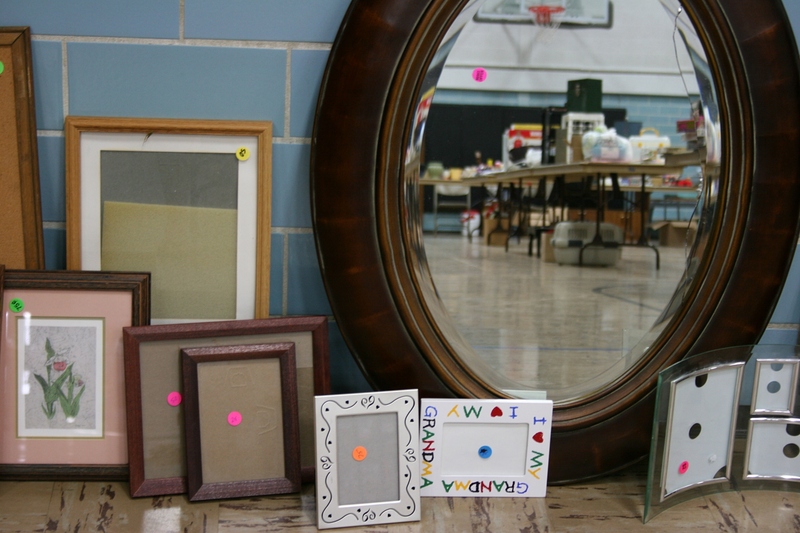 I expect you will find something you “need.” How could you not in a gymnasium packed with treasures? 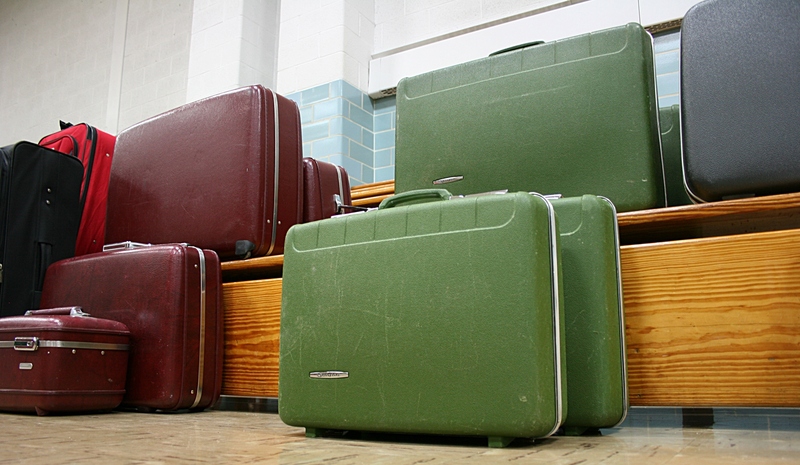 There are plenty of hard-sided suitcases for sale and a few soft-sided also. I have not seen curlers like this in 40 years, just like my mom used and occasionally poked into my head. 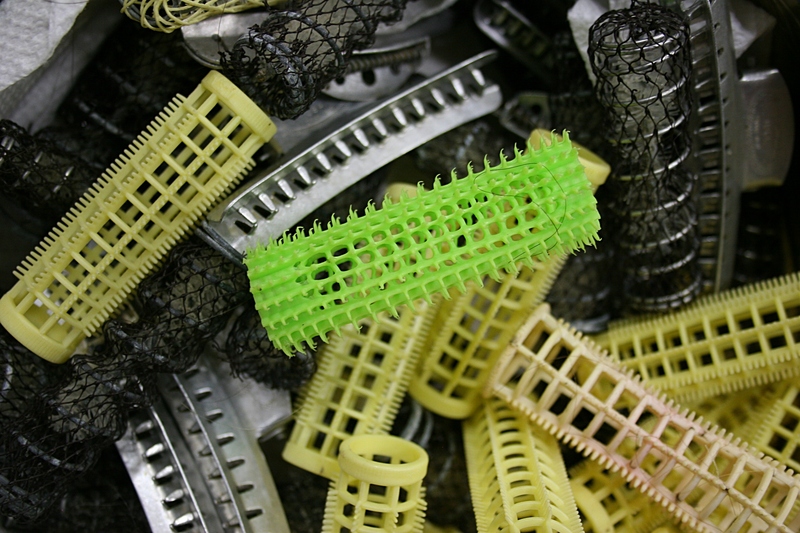 The plastic pins for securing the rollers are included. This vintage timer was made in one of my favorite Wisconsin towns, Two Rivers, along Lake Michigan. 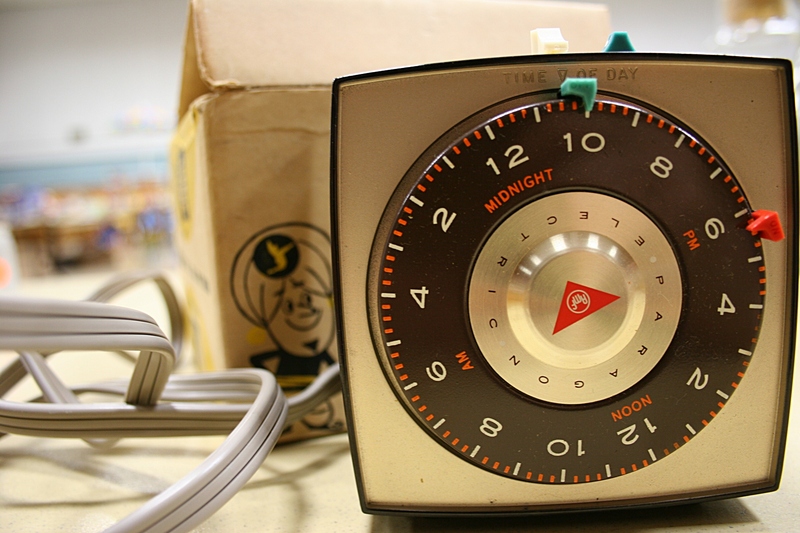 The box and the literature inside are as vintage cool as the timer. A peek at some of the furniture. 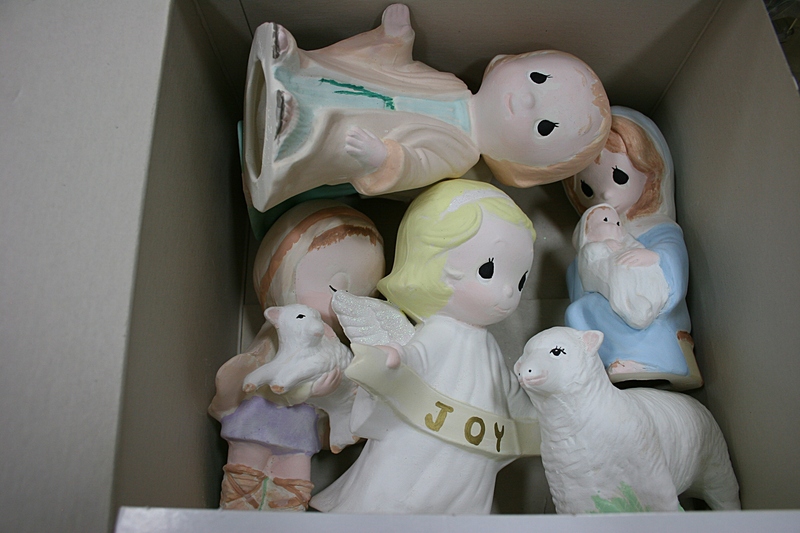 Among the abundance of Christmas decor, I spotted these precious Nativity pieces.